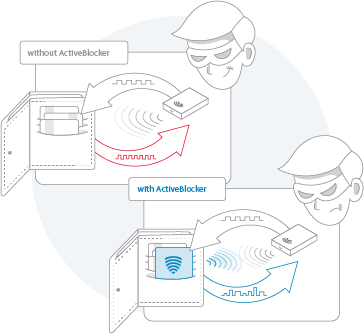 Contrary to most protection systems which passively block RF waves, ActiveBlocker operates actively. By sending arbitrary data to the field it jams signals of other cards and does not allow the attacker to access them. ActiveBlocker is based on NFC technology. Upon 13.56MHz RF waves detection, the card starts to emit disruptive transmission, which effectively blocks access to all proximity cards within its range. A single ActiveBlocker can protect the whole wallet. It blocks signals from all cards which operate in NFC technology - payment cards, identification cards, access cards. Active protection is possible thanks to energy harvesting. All necessary energy is derived from the RF field. No battery is needed nor product replacement is required. ActiveBlocker in its card form can be easily moved, depending on current needs - it will protect a wallet or any card holder. ActiveBlocker has been designed and developed by a team of engineers with over 15 years of experience in design and development of NFC chips and products. ActiveBlocker is based on an innovative, low-power chip, designed and developed by OmniChip engineers. Using energy harvesting to power itself, it generates active disruption sequence, effectively blocking access to all cards within its range. 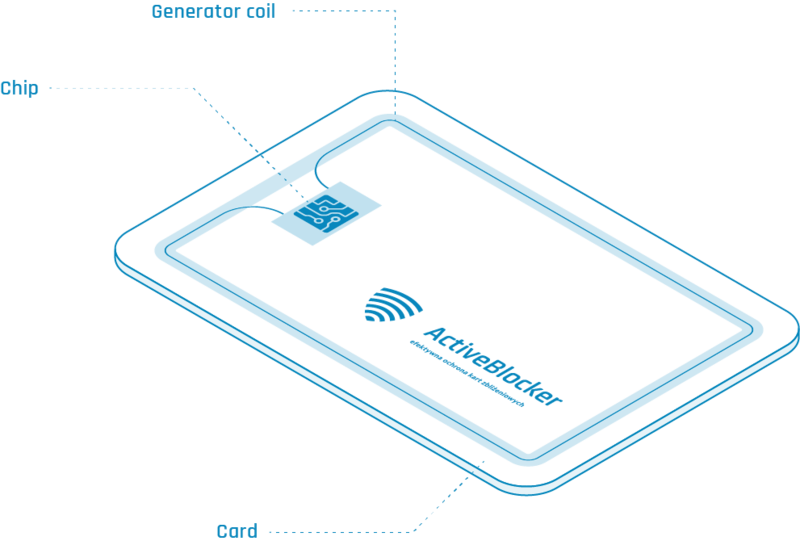 ActiveBlocker operates in a wide range of NFC field levels, spanning from extraordinarily low to extremely high, enabling protection at various physical distances and arrangements with the reader and other cards.